Made to the highest quality and standards using only Grade 5 6AL/4V Titanium. Rolled threads and polished to give a very attractive finish. All our Titanium Anodising is done in-house this way we get to control the finish. Every item is Anodised one at a time to give the very best finish you can get. Every product you see on our website is in stock. Each order is shipped on the day every day by royal mail first class. And it’s free to customers in the Uk. We are that proud of our products that Every Titanium item we sell comes with a lifetime warranty. We guarantee all our Nuts Bolts washers and anodising. 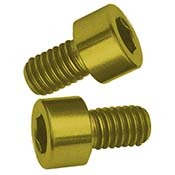 Aerospace Grade 5 6AL/4V Titanium fasteners Supreme Quality. Our Titanium is made by the best for the best. Our number one aim is to make our customers happy. Our colours include - Bronze - Purple - Blue - Ice blue - Gold - Rose Gold - All Titanium bolts and fasteners are anodised one at a time to create the perfect finish Guaranteed. Our Gold bolts are a light gold we can also produce rose gold. Our Blue Titanium anodising is stunning take our word for it we have never had a blue bolt returned. Our deep purple is incredible we take great care when anodising purple. it can be touch sensitive but nothing a quick wipe can not fix to bring the colour back to life. Our Ice-Blue Titanium is very light like ice and we think we are the only company that produces such a colour. very unique to us.